Get your kids singing with this bumper collection of 61 well-loved Sunday school tunes. ‘61 Songs Kids Really Love To Sing’ is exactly what you’d expect from the title – loads of kids songs for one small price. Scroll down the list and you’ll see some golden oldies from back when you were little and with this double-CD including all the lyrics, you and your kids can sing them all together. 61 Songs Kids Really Love To Sing by Various Artists was published by EMI in February 2013 and is our 13976th best seller. The ISBN for 61 Songs Kids Really Love To Sing is 5099943365524. Be the first to review 61 Songs Kids Really Love To Sing! Got a question? No problem! Just click here to ask us about 61 Songs Kids Really Love To Sing. A:Certainly, this 2CD set features 61 'Kids Choir' recordings, all with children singing (rather than being backing tracks). Full lyrics are included. Kids LOVE to sing! Whether its a song they learned at Sunday School or a song they learned at Preschool, they want to share it with you. 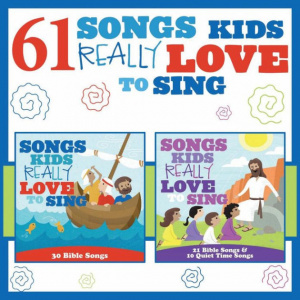 61 Songs Kids REALLY Love To Sing features popular Bible songs, hymns and quiet time songs. Includes all the printed lyrics in the paper inserted included in the jewel case. This bargain priced collection is sure to bring back memories from your childhood and help you make new ones with your kids as you sing along. Lyrics included. “I enjoyed it so much that I bought one for myself also! Not boring, lively and nicely done musical renditions, but sweet and child-like as well – very pleasant, inspirational and seasonal! Great job!” – toobizzy, ChristianBook.com Customer Review. Now Playing: The Happy Day Express Your browser does not support the audio element.